TrueCar Announces Winner Of DrivenToDrive Veterans Program Van Giveaway | TrueCar, Inc.
SANTA MONICA, Calif., Nov. 14, 2017 /PRNewswire/ -- U.S. Army Veteran Major Peter Way had a new reason to commemorate Veteran's Day this year, as he was presented with the keys to a brand new cargo van, courtesy of TrueCar (NASDAQ: TRUE) as part of their DrivenToDrive program. Way, a resident of Augusta, Ga., was chosen as the winner of the van after submitting an essay answering the questions "What Drives You?" and "How Would You Use a New Van?". Way was recognized for his selfless service on stage Saturday during the closing ceremony of Team Red White & Blue's (Team RWB) 2017 Old Glory Relay at the Westfield Brandon Mall in Tampa, Fla. In 2003, Way was stationed in Afghanistan with Army Special Operations where he worked as a Special Forces Medic, when he was injured twice; once by a grenade and the second when he was pulling another soldier out of a vehicle after an ambush attack. Way served until 2013 when he was medically retired because of his injuries and has since endured more than 30 surgeries, including the amputation of his right leg in 2015. After a long and difficult journey, Way has found adaptive sports to be critical to his recovery, including adaptive mountain biking, hand cycling, kayaking, cross country sit skiing, and wheelchair basketball. In fact, in addition to participating in previous Old Glory Relays, Way has been active with the US Paralympic Nordic Program, Team Semper Fi, Team Red White and Blue, Wounded Warrior Project, Wear Blue Run to Remember, Warfighter Sports, and the Challenged Athletes Fund. "I strive to be an example of strength and perseverance for veterans and non-veterans alike to show that if you want to do something, you can no matter what adversity you may encounter," said Major Peter Way, Veteran U.S. Army. "When I lost my ability to drive because of my injury, I really lost a huge chunk of my personal freedom and identity. This van is really a way for me to take care of myself and my family without needing anyone's help. I'm so thankful to TrueCar for this van and giving me back my freedom." 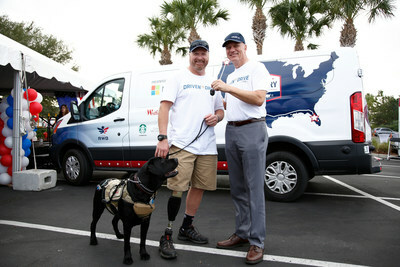 As one of the key sponsors for the Old Glory Relay, TrueCar equipped Team RWB with a van that traveled alongside relay participants as they made their way across the country. At the end of the cross-country journey, TrueCar CEO Chip Perry, and honored guest, Army Ranger Veteran Sergeant First Class Cory Remsburg, announced Major Way as the winner of the DrivenToDrive contest, which was open to active members of the military, veterans or immediate family members. "We're so thankful for and inspired by the men and women, like Major Way, who selflessly serve this country every day," said Chip Perry, president and chief executive officer, TrueCar. "Knowing that this van will help Peter and his family continue to enjoy their athletic pursuits, as well as help Peter regain some of his individual freedom is why we developed the DrivenToDrive program and we're happy to have a small part in Peter's infectious zest for life!" Once delivered, the van will be retrofitted to accommodate Way's physical needs and will provide the much needed space for all of his adaptive athletic equipment, his family and support dog, Rory. For more information on the TrueCar DrivenToDrive program please visit www.truecar.com/driventodrive. For additional images from this weekend's event please click here.